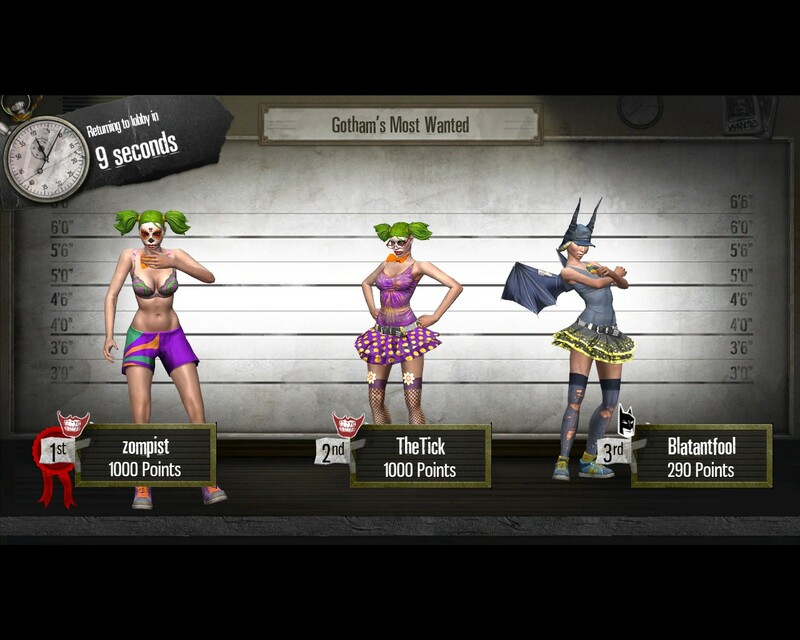 I’ve been playing Gotham City Impostors, now available at the very attractive price of free. There’s a story, sort of: the Joker and Batman seem to be out of town, and to take their place is a whole army of imitation Bats and Jokerz. Armed with guns, shooting each other. It’s probably best thought of as TF2 like. Need a gas dispensah heah! Rather than classes, there are a bunch of different weapons: assault rifles, shotguns, bow and arrow, katanas, rocket launchers, sniper rifles. All of these operate about as you’d expect. Plus a few wacky items, like a gun that shoots parrots. You also choose a body type, which determines your speed and damage absorption. You also get gadgets, though you can only have two equipped at a time. There’s a number of traps and throwing weapons, goggles to let you find enemies, and a number of ways to get around, including roller skates, jetpacks, and grapple gun. The latter is pretty sweet, as you can go long distances very quickly, and even slam into enemies. You can’t get all the toys at first; you have to earn XP. But levelling is incredibly fast, almost one per match… I’ve been playing for under a week and I’m on level 50. So you can soon get the loadout you like. Oh, you can also earn costume coins to dress your character. Or undress: you can go around in your underwear– and the lingerie items are the most expensive costumes in the game. This is kind of clever and deplorable at the same time. 1500 coins for that top! Anyway, how does it play? It’s frantic and, like TF2, there’s a bit of a learning curve. I was dying constantly till I got a rocket launcher, which evened things out a bit. (For close quarters, however, I’ve learned to switch to shotgun.) A lot of the game consists of wandering around the maps trying to find enemies, then getting surprised by a shot in the head. 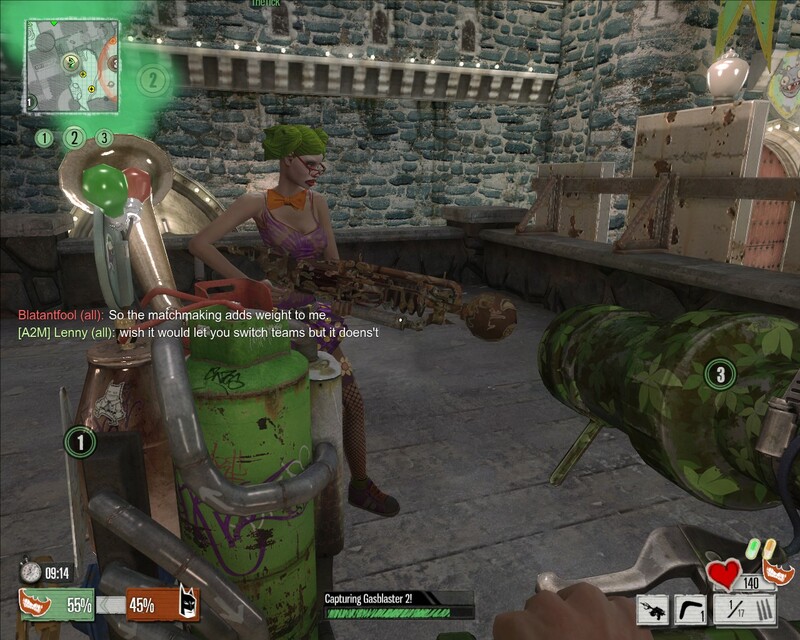 To reduce the surprise element, you can use the goggles, which reveals outlines of the enemy players to your whole team– plus you get a tasty targeting assist. The best game mode is Fumigation, which involves capturing gasblasters, trying to saturate the map with your team’s gas. 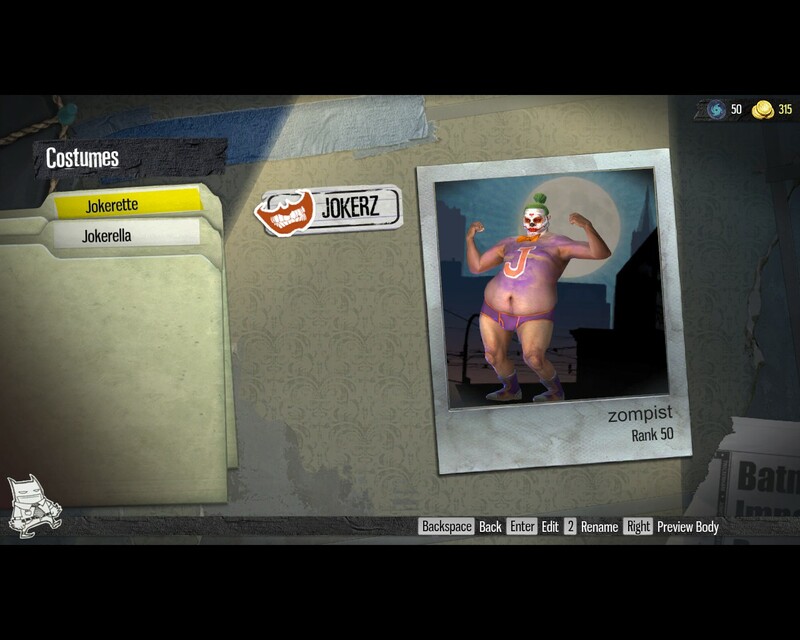 Joker gas kills all the enemies; Bat gas brings a swarm of bats which overwhelm the Jokerz. The fun bit is that the pubbies usually have no concept of strategy. So I like to rack up points (and nudge toward victory) by going round the enemy position and capturing the point near their spawn, while everyone else is fighting for the middle gasblaster. You may be wondering if all the players are Battettes and Jokerellas. By no means! Don’t you wish you could unsee that? Connecting to servers is a frustratingly slow process sometimes (though you can access your loadout or check your feats while you wait). However, playing with friends seems to be seriously broken. A friend and I tried to create a party tonight (which basically just means you’ll end up in the same match), and we’d either not see each other in the friends list, or else it’d crash attempting to join a game. Sigh. I think I like it better than DC Universe Online, a more traditional MMORPG set in Gotham and Metropolis, which was fun for awhile but couldn’t quite hide the pointless grinding. Impostors does better by keeping things simple– it’s basically a fun deathmatch game that uses just enough of the Bat-Joker rivalry to be interesting. It’s no Counterstrike; it has a lot of features designed to appeal to less twitchy players, such as an electric gun with enemy-seeking energy pulses for those who can’t aim at all. A good sniper can cause a lot of damage– but then someone with goggles can point them out, giving the other team a good chance at taking them out. So it’s not deep; I don’t expect to see Impostors pros. But it’s good deathmatchy fun. As with TF2 now, the company hopes you’ll buy extra stuff: clothing, guns, mascots, even options to gain XP faster. None of it is necessary; it’s just preying on impatience.